Dr. Hanlin L. Wang is a Professor at the David Geffen School of Medicine and a Gastrointestinal/Liver Pathology faculty. He received his medical degree from the Wuhan University School of Medicine in China and his Ph.D. in Biomedical Sciences from the Mayo Clinic in Minnesota. He completed his pathology residency and Gastrointestinal/Liver Pathology fellowship at the University of Chicago Hospitals. 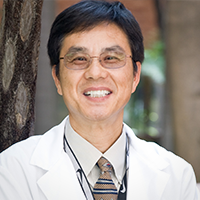 Dr. Wang is board-certified in Anatomic and Clinical Pathology. He has authored more than 130 journal articles, numerous book chapters and invited reviews, and 1 pathology textbook (co-editor). He has been an invited speaker at numerous national and international meetings and serves on the editorial boards for several pathology/medical journals. Dr. Wang was Director of Gastrointestinal Pathology at Cedars-Sinai Medical Center and an Associate Professor at Washington University Barnes-Jewish Hospital in St. Louis before joining UCLA. His clinical and research interests include medical and neoplastic gastrointestinal and liver diseases. Koo J, Wang HL. Acute, chronic, and humoral rejection: pathologic features under current immunosuppressive regimes. Surg Pathol Clin. 2018; 11:431-452. Torous VF, De La Cruz AL, Naini BV, Wang HL. Cholangitis lenta: a clinicopathologic study of 28 cases. Am J Surg Pathol. 2017; 41:1607-1617. Wang HL, Kim CJ, Koo J, Zhou W, Choi EK, Arcega R, Chen ZM, Wang H, Zhang L, Lin F. Practical immunohistochemistry in neoplastic pathology of the gastrointestinal tract, liver, biliary system and pancreas. Arch Pathol Lab Med. 2017; 141:1155-1180. Whitcomb E, Choi WT, Jerome KR, Cook L, Landis C, Ahn J, Te HS, Esfeh J, Hanouneh IA, Rayhill SC, Gibson W, Plesec T, Koo J, Wang HL, Hart J, Pai RK, Westerhoff M. Biopsy specimens from allograft liver contain histologic features of hepatitis C virus infection after virus eradication. Clin Gastroenterol Hepatol. 2017; 15:1279-1285. Koo J, Dawson DW, Dry S, French SW, Naini B, Wang HL. Biopsy findings in patients with small bowel transplantation. Clin Transplant. 2016; 30:1433-1439. Kim CJ, Baruch-Oren T, Lin F, Fan X, Yang XJ, Wang HL. Value of SATB2 immunostaining in the distinction between small intestinal and colorectal adenocarcinomas. J Clin Pathol. 2016; 69:1046-1050. Lee MJ, Venick R, Bhuta S, Li X, Wang HL. Hepatic fibrinogen storage disease in a patient with hypofibrinogenemia: report of a case with a missense mutation of the FGA gene. Semin Liver Dis. 2015; 35:439-443. Lai JP, Chen ZE, Lok T, Chan OTM, Himmelfarb E, Zhai QJ, Lin F, Wang HL. Immunohistochemical stains of proliferating cell nuclear antigen, insulin-like growth factor 2 and clusterin help distinguish malignant from benign liver nodular lesions. J Clin Pathol. 2014; 67:464-469. Iliev ID, Funari VA, Taylor KD, Nguyen Q, Reyes CN, Strom SP, Brown J, Becker CA, Fleshner PR, Dubinsky M, Rotter JI, Wang HL, McGovern DP, Brown GD, Underhill DM. Interactions between commensal fungi and the C-type lectin receptor Dectin-1 influence colitis. Science. 2012 Jun 8; 336(6086):1314-7. Liapis H, Wang HL. Pathology of Solid Organ Transplantation. Springer, Heidelberg, 2011.